Miss Mani Monster! 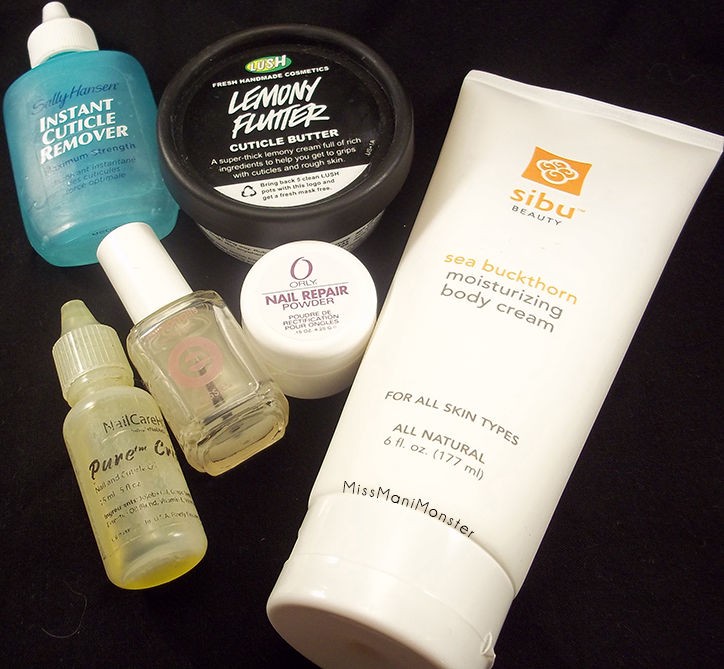 : My Nail Care Arsenal! I wanted to let you guys in on the products that are MUST-HAVES for me! As much as I love painting my nails, it takes some amount of effort and investment to take care of my hands, cuticles and nails, as any nail blogger will tell you! I can tell you right off the bat about one I've already posted about, and that's Pure nail oil - an oil that restores the water to oil balance in your nails and keeps them strong and flexible while conditioning your cuticles. It's fantastic, and the little bottle will literally last you forever since you only need a tiny drop for your whole nail bed! 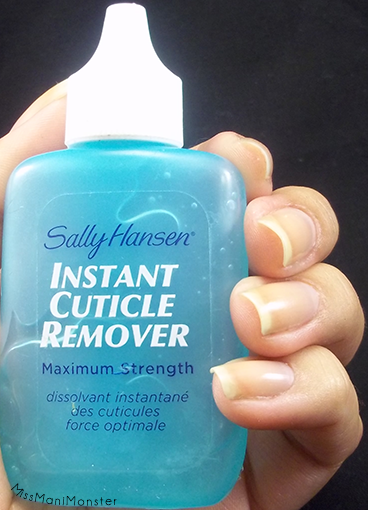 I've been coming back to this one for over a year now- Sally Hansen Cuticle Remover. 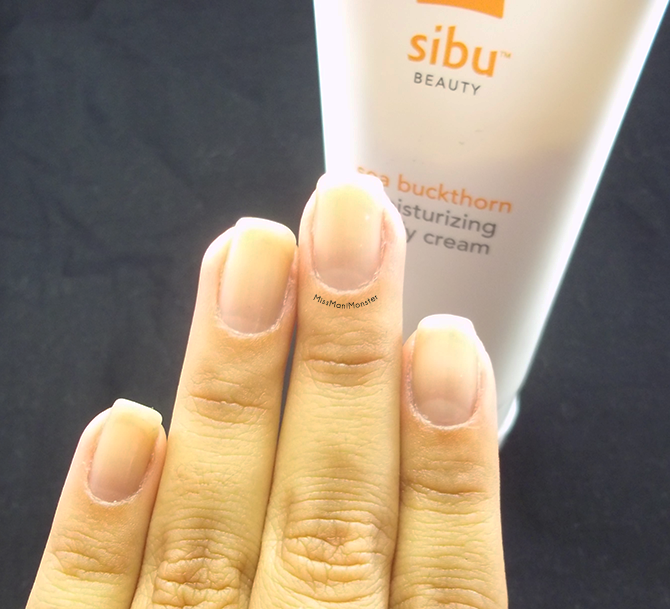 This gel makes it easy to push back my cuticles and makes it super easy to deal with them! 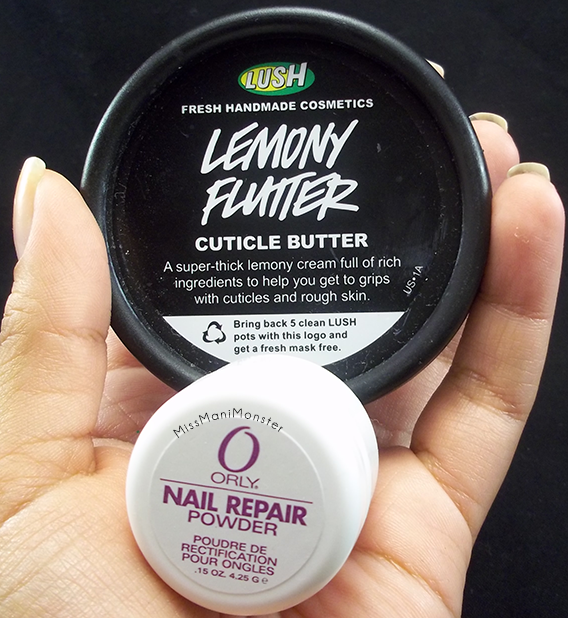 Next are a few finger savers - Lush's Lemony Flutter for pesky dry cuticles, and Orly Nail Rescue, for the ever-feared break, which does happen on occasion! Lemony Flutter keeps my cuticles soft and healthy, and Orly Nail Rescue is my go-to whenever I have a nail that even HINTS at breaking! Next is a product I've literally gone through twice, and have backups of - Essie Millionails. This is forever my favorite basecoat, and I've been through several. This baby is super conditioning for my nails and keeps them strong, while still binding my nail polish really well. Finally is a product I've been testing out for about a week and a half now, and I can never look back. It's called Sibu Beauty Nourishing Body Cream, and it is FABULOUS. Coming from someone who literally applies hand lotion about ten times a day, you can trust me when I say this stuff is just amazing. It's light and not at all greasy, but it really makes you feel moisturized and keeps your hands soft and supple. It soothes yours skin, and it's good for all skin types with 100% natural ingredients. It's powered by sea buckthorn, meadowfoam, shea butter, and aloe, and it really softens and hydrates quickly and lasts for a while. I really love this stuff, and though this bottle was provided for review, I'll probably be ordering a few in the future! What are your nail care go-to's? Let me know in the comments if there are any I'm missing!